First, that you go to your local library and borrow a copy of my book, Nellie Bly: Daredevil, Reporter, Feminist. Great historians inform themselves before they call authors and endeavor to ask questions that the book does not answer. (Hint: Why I wrote the book is detailed in the introduction, so not a great question…) If your library does not have it, the librarians can ask for it through Interlibrary Loan. If you are impatient, you can get a used copy via Amazon for very little money (or a lot if you want a signed first edition) or the Kindle edition which you can download instantly on a mobile device or computer. It’s even free if you have an Amazon Prime account. So there really is no excuse for not coming to me prepared! For good measure, here is a link to a PDF of the book’s introduction, which may answer some of your questions. 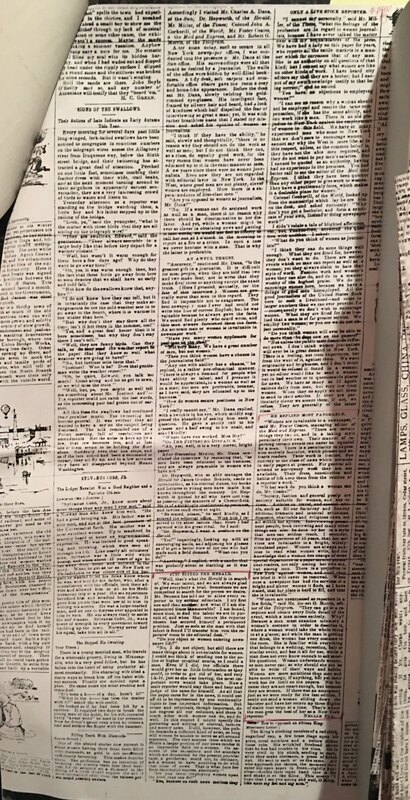 And for fun, since I’ve heard the microfilm reel has disappeared, here is Bly’s August 21, 1887 article for the Pittsburg Dispatch about what New York City’s top editors thought about hiring women. More fun: This podcast from Brains Out! that features Nellie round about the middle of the show. Another good reason for getting a copy of the entire book, either actually or virtually. In the back, under NOTES AND SOURCES, you’ll find a roadmap to where you can find every primary source I used to write the book, from town and national records (even in Austria) to university libraries, to personal archival collections to the Library of Congress. By now you’ve probably found all the great Bly repositories on the internet, and if you haven’t already, you should. My database, has a compilation of all her great undercover reporting of the early years (1887-89) and copies of her books (they are really just her newspaper articles between covers) are available online, too, via this repository at the University of Pennsylvania. 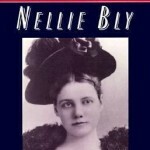 Just search “Nellie Bly.” As for the text of her articles, go here, where they have been transcribed, or to NellieBlyOnline, if it is functioning, where you will find PDFs of many of her famous pieces. Just below is an amateur video of a presentation I gave on June 14, 2018 at the Roosevelt Island branch of the New York Public Library, on behalf of the Roosevelt Island Historical Association. In 45-minutes, I cover Bly’s entire life, womb to tomb. For the deeper researchers, I’ve posted five pages on Bly (there is more about her if you check the index) in my 2012 book, Undercover Reporting: The Truth About Deception, which is available through Interlibrary loan or digitally through Google Books. I’m posting all the most incisive reviews of the book published when the book first came out in 1994. Most were crafted by women journalists as enamored of Bly as you and I are. Scroll to the bottom of this page for links to myriad Nellie Bly sites full of information and primary sources that can be put to good use. This is a recent recap of Bly’s life for American History Magazine’s February 2018 issue. There’s a fine new article by Kim Todd in the November 2016 Smithsonian Magazine about the Stunt Girls in Nellie’s era and the good work they did. I have appeared on C-Span twice, talking about her and the subject of undercover reporting, and on WNYC’s “On the Media” a couple of times as well, once in 2009 and again in 2016. And there is the PBS.org American Experience documentary on her trip around the world: “Around the World in 72 Days, which you can order. PBS, unfortunately, has taken it off its site for the program. And do you know the Stephen Foster song “Nelly Bly” from which Nellie took her pen name? Here’s a rendition of the song for the American Experience “Around the World in 72 Days” by my daughter, Brett Kroeger (yes, the 10-year-old from the book’s introduction), when she was not much older than that. The more prepared you are, the fresher your questions, the more enthusiastic I will be about our conversation. And the better historian you will prove to be. Also, because it is often a struggle to find a time in your school day and mine that coincide for an interview, I’d suggest you email me your questions and I’ll record responses and email them right back to you just as soon as I can.